I recently published a blog about the criminal charges and an apparent forfeiture action against internet pharmacy operators Billy Lee, Tarn Uppal, and Tony Lee, who operate or operated internet pharmacies approved by PharmacyChecker or the Canadian International Pharmacy Association (CIPA). The court filings relate to the defendants’ alleged sale of misbranded prescription drugs and to money laundering (conspiracy charges). This is an important and timely issue: proponents of the Canadian internet pharmacy sector, including CIPA and PharmacyChecker, have advocated for the legalization of sales of drugs from “Canadian” and other “international” internet pharmacies into the US. Part of the industry's argument, explicitly or implicitly, is: Trust us. But by exposing how CIPA- and PharmacyChecker-approved internet pharmacies often really work — selling drugs that don’t really come from Canada — the court filing potentially threatens those political efforts, and my blog seems to have caused some panic among their ranks. Indeed, PharmacyChecker’s President, Tod Cooperman, posted his own blog in response to mine, accusing me of “lying” and frantically denying that any PharmacyChecker-approved internet pharmacy is charged in the case. Unfortunately for Mr. Cooperman, the connections between Billy Lee, Tony Lee, and Tarn Uppal (who are being criminally charged), and the internet pharmacy websites listed in the court filings as targets of forfeiture (and that are PharmacyChecker and CIPA approved) are straightforward. More importantly, they provide insight into how the industry works. In the interests of brevity, I won’t list all of the connections below, but here are some highlights. 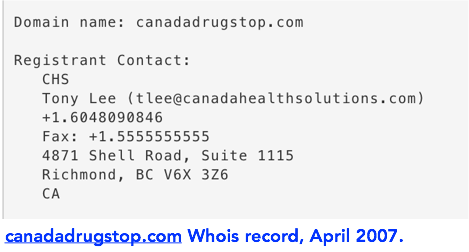 Tony Lee can be seen as the domain name registrant (website operator, essentially) for canadadrugstop.com, one of the internet pharmacies listed in the criminal case filings as a forfeiture target, as shown below in this record from April 2007 (again, during the time period named in the allegations). 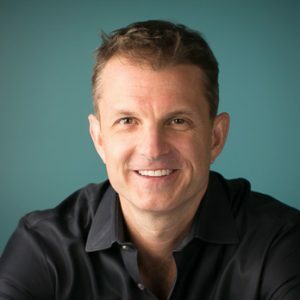 He used the domain name canadahealthsolutions.com in his email registration, and was the original incorporator of the eponymous Canada Health Solutions, Inc., a common DBA for this internet pharmacy enterprise. The corporate registration lists the same address as appears in domain name registrations for websites like buywellbutrin.us, which (surprise!) 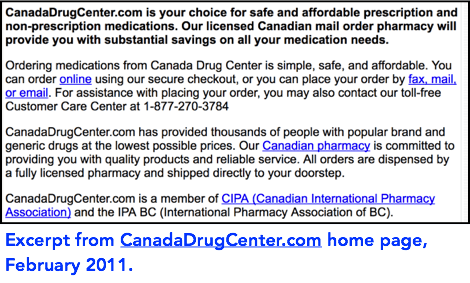 is still a redirect to PharmacyChecker-approved canadianpharmacymeds.com, also listed in the criminal court filings. Tarn Uppal, meanwhile, was also named in the corporate registration for Canada Health Solutions (see link above), and was elsewhere identified as the company’s operations manager and VP. Mr Uppal — or the email he commonly used, “[email protected]" — also appeared in the Whois details at various points in time for some of the internet pharmacy websites listed in the criminal court filings, including canadadrugpharmacy.com, canadadrugcenter.com, and globaldrugsonline.com. But the larger objective here isn’t dinging PharmacyChecker or CIPA for its own sake. It’s about showing how the offshore internet pharmacy industry and the certification entities they rely on have, working together, helped present an image of Canadian internet pharmacies to the world that is, at best, misleading. To demonstrate that, I'll close with a few final screenshots. Here’s are excerpts from the home pages of canaddrugpharmacy.com, canadadrugstop.com, and canadadrugcenter.com from early 2011. 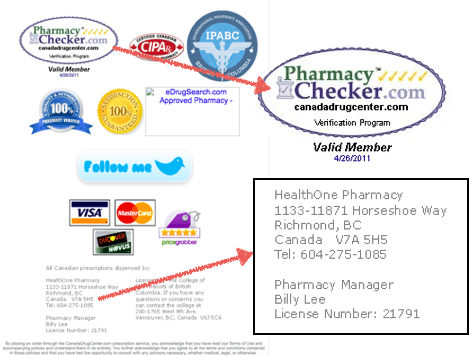 If you saw the text below on a website’s home page, accompanied by 1) a certification by the “Canadian” International Pharmacy Association and PharmacyChecker, 2) domain names with “Canada” in them, and 3) a reference to a licensed pharmacist (Billy Lee) in Canada, wouldn’t you think you were really getting drugs from a pharmacy in Canada? I sure would. But as LegitScript has repeatedly seen (including through indictment of PharmacyChecker-approved CanadaDrugs, which allegedly sold counterfeit cancer medicines originally from non-Canadian locations through its clinic-focused business line), and as alleged in these criminal filings, the drugs often are not really from a Canadian pharmacy at all.